They say that imitation is the sincerest form of flattery, but Shopsmith Inc. wasn't impressed as the Taiwanese clones started to flood our shores back in the 1980's. The original patents on the Shopsmith Mark V began to expired in the mid-1970's, and by the early 1980's there were several semi-faithful knock-offs being sold in the USA. Most were being made in Taiwan and were sold under names like Total Shop, FUSSO, Enco, Menards, WoodMaster, ShopCenter, MasterShop, Summit Shop and Multico (in the UK) to name a few. One of the interesting stories about these tools is that the guy who shipped-off an American Made Shopsmith Mark V to Taiwan to be copied wasn't aware that about a half-dozen Mark V's got past the quality control folks with a slight crack in the headstock casting. Wouldn't you know that the original clones all had this crack cast into them! It’s on the front near the headstock lock if you want to locate it, and I’ve seen it with my own two eyes. I often wondered if they ever fixed this or if they just put Bondo on them before painting. These original clones were made by a company called Johnson Metal Industries Co. Ltd of Taipei, Taiwan, and believe it or not they actually had their US agent approached Shopsmith Inc. about producing the Shopsmith Mark V for them to "preclude unnecessary competition"! That's what we in America call anti-trust. Not long after this, another Taiwanese company called King Feng Fu Machinery Works Co. Ltd. started selling their own clone of the Mark V, and Johnson Metal was ballsy enough to file a lawsuit against them for stealing their design! Before the International Trade Commission was able to rule on a complaint filed by Shopsmith Inc. in 1982, these parties made an agreement with Shopsmith that included making cosmetic changes to their machines, such as moving the on-off switch, cutting openings or lovers into their legs, etc, and prominently displaying the country of origin, which was and still is the law of the land. They also agreed to stop saying such things as "Our machine was designed by the same Engineers as the Shopsmith". Well, of course, it was, because you copied the Shopsmith! These clones show up both new and used from time to time, and the odd thing about the used ones is they tend to be in horrible condition. I'm not sure if there is a correlation to the care someone gives an inferior tool, or if they just aren't worth keeping under cover, but so many of them are covered in rust from being stored outdoors. Anyway, there are slight differences between the Mark V and the clones, because of the reverse engineering process, several parts are slightly smaller than the original. The SPT (Single Purpose Tools) can be driven with a Mark V, but the interior parts of the headstock are just a bit too odd to be used in a genuine Mark V. Be aware that some of the clone jointers are not 4" like a Shopsmith jointer, but rather are 6" wide and sports 4 knives instead of the Shopsmith's 3. That may sound like a great deal, but remember that you are going to be lifting that anchor on and off your Mark V, and seeing that they didn't make them any longer, there isn't much of an advantage to the extra width. Also, some of the clone bandsaws do not have the patented auto-tracking feature. The easiest way to tell is if it has a knob on the back of the unit for tilting the upper wheel, it's not made like a Shopsmith bandsaw. Oh, I almost forgot! Most of the cast metal parts on the clones are made from sand-cast iron, not precision die cast aluminum like the modern Shopsmith Mark V. This means everything from the headstock to the tables are HEAVY! Again, on the surface, this sounds like an improvement, but actually, it's not. Every part is prone to rust and the extra weight just gets in the way when you try to manipulate the tool from one function to another. 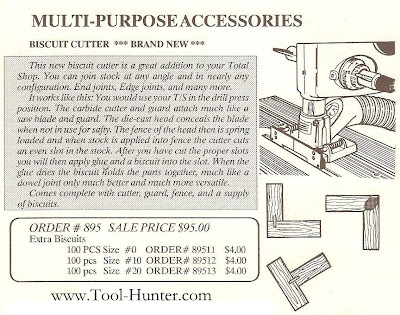 The other problem that TotalShop caused for themselves was that when they copied the Shopsmith Biscuit Joiner they used illustrations lifted directly for the Shopsmith Biscuit Joiner owners manual in their manual and in the introductory ad they ran in their catalog. This was obvious to even the casual observer because the illustration showed the Biscuit Joiner mounted over a ribbed Mark V 510 table. As I already mentioned, the Total-Shop tool was a copy of the 500 and therefore the main table had no ribs or the holes that are clearly seen which are used for mounting the Shaper Fence only on the Shopsmith Mark V, Model 510. Oops! At the time of this infraction, copyright law protected the illustrations for 75 years or for the life of author plus 50 years. Today that coverage is 95/120 years or life plus 70 years. I was working for Shopsmith Inc. at the time and received a TotalShop catalog at my home. I noticed the copy of the Biscuit Joiner and called Shopsmith’s lawyer, who also happened to be an active student in the Dayton Shopsmith Academy where I was the instructor. He went to work and within a few short weeks he stopped by the shop and said he had something to show me. We went back to the Quality lab and he showed be boxes full of poorly made Biscuit Joiners that TotalShop was forced to surrender. In the end, they had to recall all the biscuit joiner units they sold, and surrender both the units and the tooling to Shopsmith. I was allowed to take one of the Total Shop biscuit joiners as a reward. I’ve heard a lot of talk on the forums that this incident was the death-blow for TotalShop, but I don’t believe that this is the case. The incident I describe above happened around 1993-94, but they were still running ads in Popular Science 1996. That’s not to say that this didn’t start the bleeding that eventually led to their sell-off. Click here for Shopsmith-like Clone machines from Total shop. 1986 Total Shop Ad "Compare Total Shop with Shopsmith"